Chronicle Books, 2017. Originally published in Japan in 2003. 32 pages. This book charmed, surprised, and enchanted me. The book starts in the middle of the action, well, in the middle of a snack. We see a little blonde girl and her younger brother, and she’s got big surprised eyes. She left her jump rope at the park! She goes to get it, and Lukie comes along. But when they get to the park, the jump rope isn’t there. But they hear laughter in the trees. They go to investigate. the swish, whip of the jump rope. But it wasn’t Thomas and Samantha jump-roping. 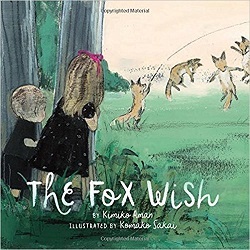 The spread shows the children looking out from behind some trees at a line of foxes jumping rope. Two are turning the rope, one is watching, and seven foxes are joyfully jumping, in various poses in the air. The foxes were not very good at jump rope. They were good jumpers, but their tails kept getting caught in the rope. Lukie can’t help but laugh. So then they come out and join the foxes. The foxes politely ask them how to jump rope without tripping, and Roxie is glad to explain that they simply need to hold their tails up. They all have a lovely time jumping rope together until it starts to get dark. When it’s Roxie’s time to turn the rope, she sees that the rope indeed has her name on the handle. But when it’s time to go home, there’s a surprise. This is the part where I was utterly charmed. I don’t want to give it away, so let me just say that it’s delightful to watch wishes come true. I love this book. The illustrations (Those fox faces! The joyful jumping!) are a big part of that. But also the story of a little girl who learns to give joy to others. Ballantine Books, 2017. 478 pages. When Alexandra Boyd gets off the plane in Sofia, she’s jet lagged, exhausted, and not even thinking straight. She’s in Bulgaria to begin teaching English, but came a month early to do some sight-seeing. First, the taxi driver brings her to a nice hotel, instead of the hostel where she has a room booked – and drives off before she can fix it. While she’s trying to figure out what to do, she sees an elderly couple and a younger man come out of the hotel. As the younger man is helping the older man in a wheelchair get into a taxi, the older lady stumbles. Alexandra catches her arm and helps her. And then she passes their bags to them and helps them settle in the cab. The younger man thanks her, and chats with her about her travel plans. She asks if she can take their picture – the first people she’s spoken to in Bulgaria. Then Alexandra gets into a taxi and heads for her hostel. But as they are driving away, she suddenly notices that she has the tall man’s satchel. When she opens it up, it contains an urn with ashes and a name on the urn, Stoyan Lazarov. She asks the taxi driver to stop and bursts into tears. When Alexandra opened the urn, she began to cry not because she was afraid of human remains but because it was just too much, the last straw. She was in a strange country, she was exhausted, her plans had already gone awry, and in the dramatic way of the young she felt herself in the grip of something larger — destiny, or some plot that could as easily be evil as good. Alexandra has the driver, who says she can call him Bobby, take her back to the hotel, but there’s no sign of the people who lost the urn. She goes to the police, which Bobby doesn’t think is a great idea. But the police give her an address to try. First, though, she and Bobby drive to the monastery where the tall man said they’d be traveling. In the monastery, Alexandra and Bobby get locked into a room, but it turns out Bobby has lockpicking skills. 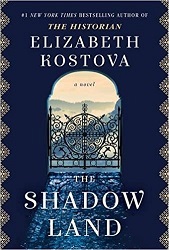 By now Bobby is interested in Alexandra’s quest, so they continue on the trail of the Lazarov family. Each place they go, they find the family is not there, but get another lead of a place where they might be found. Along the way, they find out more about Stoyan Lazarov as well. But at the same time, as they travel, Bobby’s car is vandalized and they get threatening notes. Someone besides the Lazarov family seems to want the urn. This book has a chase saga and a mystery, as well as being a story of a young American woman traveling in Europe on her own for the first time. Just when I thought it was especially lovely, pleasant reading, the book starts delving into the history of Bulgaria – particularly Stoyan Lazarov’s time in a prison camp – particularly brutal and awful. But the overall feeling of the book is hopeful and surviving through art and through love. The story is compelling, as Stoyan Lazarov’s past has repercussions in the present. This is a very personal story, despite having large themes. Alexandra has some of her own issues to deal with, but she cares about the people she meets along the way, and the reader can’t help but care, too. The author weaves in flashbacks well, never interrupting Alexandra’s story long enough to make us impatient. I still say it’s a lovely book, even though it has some very hard chapters. The author brings Bulgaria to life so vividly and so lovingly, I wasn’t surprised to read at the back that she’s married to a Bulgarian. The plot is gripping, yet she manages to weave in lots of background material without letting up on the tension. On top of all that, these characters – from Alexandra and Bobby all the way to the man in the urn – are people you come to love. Crown Books for Young Readers, 2016. 264 pages. I had a whole lot of fun booktalking this book in the local elementary schools this year. I never realized a book about the presidents could be so much fun. I can’t predict the future. So I’m not saying that several years from now, robots will rise up and attempt to overthrow humanity and it’ll be up to you to travel through time and assemble a Presidential Attack Squad to defend America. But I am saying that we’d all feel really stupid if at least one of us wasn’t prepared for such an event. 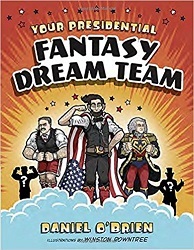 If you’re ever tasked with organizing the Dream Team of Presidents, this chapter will probably be more helpful than any other chapter in any book, ever. Whether you’re forming an action team to defend the planet or just putting together a group of presidents to pull off some kind of grand scheme, every good team needs Brains, Brawn, a Loose Cannon, a Moral Compass, and a Roosevelt. I’ve included my best recommendations for all these positions, but you should feel free to pick your own. He proceeds to tell about the presidents, rating them in terms of brains, brawn, loose cannon, moral compass and whether they’re a Roosevelt(!). 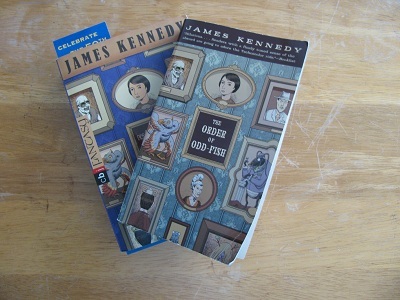 But the fun in reading this book is his irreverent tone and over-the-top descriptions. I’m afraid this book was far more entertaining than Ken Burns’ worthy and lovely picture book of presidents, though that one would probably make a better resource for reports. He includes scandalous and surprising facts such as Ulysses Grant was a drunk, and Andrew Jackson had so many bullets in his body, contemporaries said he rattled like a bag of marbles when he walked. During this time, Wilson grew suspicious of even his closest friends (something historians later attributed to undiagnosed brain damage). He went days without sleeping and his brain slowly started deteriorating, which, like everything at this point, only made Wilson angrier and more stubborn. Determined to win public support for the League of Nations, Wilson decided to go against the orders of his wife, doctors, and basic common sense, and toured the country to give speeches that would rally people to his side. He rode all over America, coughing and sneezing and being fed predigested foods (the only foods he could eat) by day, and giving rousing speeches by night (sometimes five in one day). He delivered his speeches with closed eyes, shaking hands, and a weakened voice. With his wheezing, sleeplessness, strained mumbling, rapidly failing body, and singular, obsessed focus, it’s not completely uncalled for to label Woodrow Wilson our first zombie president. It’s safe to say this is one of the most entertaining history books I’ve ever read. I normally don’t read graphic novels, let alone superhero graphic novels. I picked up this one because it was a Cybils Finalist. 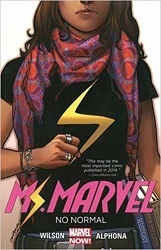 And then, looking inside, I got hooked – this is the origin story of a superhero whose secret identity is a Muslim teenage girl! Her family’s from Pakistan and she lives in Jersey City and just wants a normal life. Her parents are on the protective side. They don’t want her to go to parties, let alone fight crime. This first volume covers how she attains and tries to deal with polymorph powers. While trying to keep her parents happy and keep up with her schoolwork. But it’s her parents’ teachings that motivate her to do good when the opportunity presents itself. Little did they know it would mean she’d be fighting crime and rescuing people in danger! There are more volumes in this series, and I probably won’t review them all. (But, yes, I want to read on.) But superhero comics have come a long way since I was a kid! Now even a brown-skinned Muslim girl can become a superhero! Wow! Scholastic Press, February 2017. 372 pages. This one’s fun. 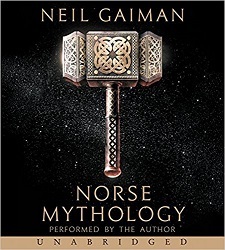 Garth Nix, the author of dark and mysterious tales of necromancy in the Old Kingdom has here taken a light-hearted and more traditional route. In a tale peppered with cleverness and delightful twists on tropes, we meet Princess Anya, whose wicked stepstepfather wants to take over her sister Morven’s kingdom. He’s her stepstepfather because he married her stepmother. The stepmother “was expected to be quite evil but mainly turned out to be a very enthusiastic botanist.” But Anya’s father died a year after marrying the stepmother, and her stepmother married Duke Rikard. So the girls had two stepparents. Their stepmother the botanist wasn’t a huge problem, but as it turned out, their stepstepfather was evil and wanted to be the king. Though Morven should by rights be crowned when she turned sixteen, in three months’ time, it was fairly certain Duke Rikard would somehow prevent this from happening. Anya’s adventures begin when Duke Rikard transforms the current prince Morven’s in love with into a frog. But then he jumped into the moat with thousands of other frogs. Morven gets Anya to make a Sister Promise that she’ll find him. Anya makes a magical dowsing rod with the help of Gotfried, their castle librarian/sorcerer, to figure out which frog is Denholm, using hair from Morven’s locket. But when she brings the frog to Morven, her sister refuses to kiss a frog. Fortunately, Gotfried has one dose left of Transmogrification Reversal Lip Balm. This works best when a princess uses it, so now Anya gets to kiss the frog. But when Anya does so, the frog turns out to have been a different former love of Morven’s, not Denholm. And then her stepstepfather, who notices someone has tampered with his spell, decides to send Anya to a distant land to school, and he’s got a new prince for Morwen who Anya realizes is a transformed magpie – with no actual family or kingdom to help Morwen take her rightful place as queen. Anya does manage to find Denholm, in the hands of the local frogcatcher. But then consultation with the Royal Dogs convinces her the time has come for her to go on a quest. When Gotfried gives her a copy of the spell for the making of “Fairly Reliable Transmogrification Reversal Lip Balm,” Anya gives in and adds to her quest a search for the ingredients to the spell, which include witch’s tears, a retired druid’s blood, and feathers fresh-pulled from a cockatrice’s tail. Along the way, Anya collects allies – but many of those have also suffered transmogrification. Anya will get their help if she promises to reverse their transformation once she makes the lip balm. And so she assembles a motley crew. Once the heralds give her the name Frogkisser, her reputation spreads. 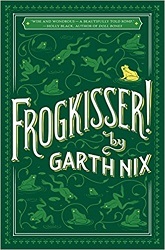 When she finally assembles the ingredients, Denholm manages to break free and get into a pond with many other transformed frogs – so the Frogkisser name is apt. This book is full of silly fun, with a nice traditional quest and amusing obstacles. I enjoyed it immensely – so I’m not quite sure why it took me a very long time to finish. Probably the episodic nature of the story made the book easy to put down. This is light-hearted magical fun that makes me smile as I write the review. You are currently browsing the Sonderbooks blog archives for July, 2017.